Integer Programming - The Global Impact: After receiving an overwhelming response from Professor George Nemhauser's plenary talk at EURO-INFORMS, he presented the talk to a group of graduate students at Georgia Tech. Here you can view this fascinating and informative video on the history and applications of integer programming. ISyE boasts the largest, single-program concentration of faculty at any U.S. university with optimization as their primary area of research expertise. Optimization, the mathematically rigorous methodology for seeking a best action among a multitude of alternatives, is a key design and operational tool in numerous critical applications.These include energy, financial, health and manufacturing systems, social networks, and supply chains. In addition to being exceptionally large, we also believe that our optimization faculty is one of the very best, anywhere. Employing any credible metric for assessing research quality, our optimization faculty has few, if any, peers. Virtually every major research-based honor and award associated with optimization has been won by at least one member of our optimization faculty. This includes the John Von Neumann Theory Prize, the Dantzig Prize, the Fulkerson Prize, the Khachiyan Prize, and the Beale-Orchard-Hayes Prize. In addition, members of our optimization group have routinely held high-level editorial posts with the most prestigious journals prominently identified with optimization including Mathematics of Operations Research, Mathematical Programming, Operations Research and SIAM Journal on Optimization. 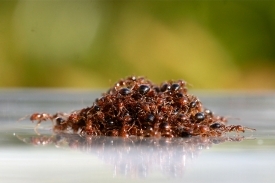 Craig Tovey is part of a team who has solved the mystery of how fire ants self-assemble into a waterproof raft. The bio-inspired research could have applications to logistics and operations research and material sciences, specifically the construction of man-made flotation devices. It also could impact the field of robotics.